If I had to sum up this year’s Falmouth Road Race in one word it would be BRUTAL. I don’t know what the temperature and humidity level was but man it was hot. I don’t think I’ve ever felt that uncomfortable running before—or at least in a long time. A few weeks ago, I would have told you my goal for Falmouth this year was to run 7:00 pace the whole way. In the days leading up to the race and looking ahead at the weather forecast, I started to think that goal wouldn’t be realistic. Standing at the start with the sun beating down on me, I threw all plans out the window and thought about just making it to the finish any way I could! Getting to the start was a breeze this year. I got a ride to the buses with Lizzie and her friend Kelly. 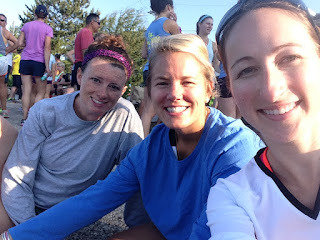 We arrived in Woods Hole around 7am, found a shady spot to sit, ate our breakfast and took a couple bathroom breaks as we waited until the 9am race. 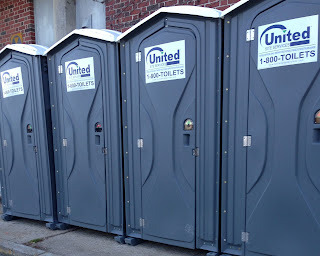 A Run Jen Run Tip: The further you walk, the shorter the line for the porta potties! At 8:30am I split up with the girls as we went to our different corrals. Last year the race started a new system where you seed yourself based on your predicted pace. It must have gone well because they brought it back for a second year. I like the idea of it as long as everyone is honest. It’s pretty annoying people think they will run faster than they are capable. Lizzie’s mom mentioned that this new system makes it harder for spectators to find racers as she is used to looking for waves of colors. She makes a good point! As for me, I was lucky to get a seeded number, which appeared to be the 7:00 pace group and faster. I’m not sure I actually earned it but I have some connections with the race :) There are a few perks having a seeded number. The biggest is that there are about a dozen porta potties at the start with NO LINES! I found a shady spot to sit and was able to see the elite warm ups, wheelchair start and the women’s start. I was always amazed watching the elite’s prepare for the race. It’s pretty motivating. The race itself started about 11 or 12 minutes late. I later found out there was an bike accident near the start—some elites warming up were first to the scene and even stopped to help out. After the women’s start I headed to my corral and only had to wait in the blazing sun for about 8 minutes before the gun went off. Side note: it was cool hearing @csteverun’s voice announcing! · Mile 1 (7:08) – One of the hardest parts about running races is not getting caught up in the excitement of the start and going out too hard or too fast. I like to think I have done really good over the years controlling myself and settling into my planned paces early on and I continued to do just that. There was a little bit of congestion during the first mile and a few annoying racers, but not that bad. · Mile 2 (7:02) – Feeling ok on the shady hills, hot but at a comfortable pace. Grabbed water at the first water stop and every single one after that. I was thinking about my spinners who make fun of me when I use the term “comfortably fast.” Thanks guys! · Mile 3 (7:06) – Got that feeling in my right calf that it could cramp up at any step. Felt like I backed off a bit and used caution on the downhills, as I knew Surf Drive was approaching. Then I suddenly got that same feeling about my left hamstring. Uh oh! · Mile 4 (6:56) – My favorite mile of the whole race! It may be the sunniest and hottest but it’s flat & beautiful and I love it! I tried to ignore the cramping even though it was getting worse with each step. I grabbed some Gatorade and thinking it was water tried to pour it in my mouth and got it all over my face. Gross. Things were starting to get steamy on Surf Drive and I started running through all the hoses while thoughts about walking were creeping into my head. The crowds started to increase and it was fun hearing so many people yelling my name! · Mile 5 (7:08) – I decided I was going to walk when I got to Shore Street but that was practically the 5 mile marker so I toughed it out through 5. · Mile 6 (8:05) – The cramping would not stop! I made the turn on Scranton Ave and walked from 5.15 to 5.25. I was so worried that when I started running again it would be worse but my legs totally needed the break. I started back up and naturally fell back into that same pace. Seeing Lizzie’s parents was nice! Thanks for the boost of energy! · Mile 7 (7:35) – One more mile! I passed by a few more people I knew out on the course and just past the 10k I had to stop again. By now it was both calves. This time was harder to walk because there were SO MANY people cheering. All telling me “You can do it!” and “Keep going Jen, don’t stop!” Another runner encouraged me as she passed and I started to run again just behind her. She turned around and offered me a GU but we were just about to make that final turn onto Grand Ave so it wouldn’t have done any good. I ran the rest of the way and was so happy crossing the finish line. They even announced my name! Woohoo! So many familiar faces as I crossed the finish line. The awesome Mass Track & Field Officials, Mr. Carroll with his camera, little John, Molly & Anna from Cape Cod Rehab, Jayna, Stacey (working hard on the FRR social media) & Gary, run clubber Kyle, and a big shout out to Caitlin Quinn—one of my blog readers who I haven’t seen in YEARS! She reminded me that I ran my first ever Falmouth Road Race back in 2002, the year before I started volunteering then eventually working full time with the race. · First time walking during a race. I did it twice! 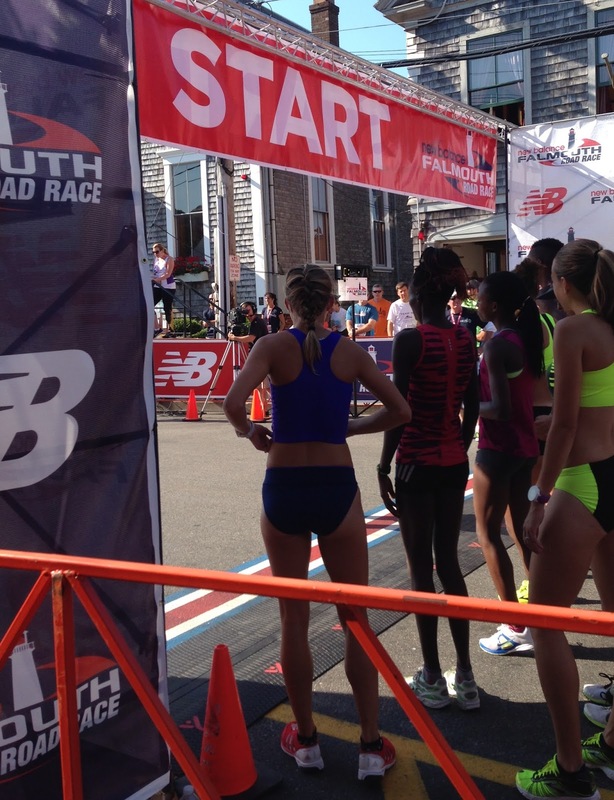 · First time running a race with my cell phone. I was actually worried with the heat & I had a lot of friends to find at the start/finish line. 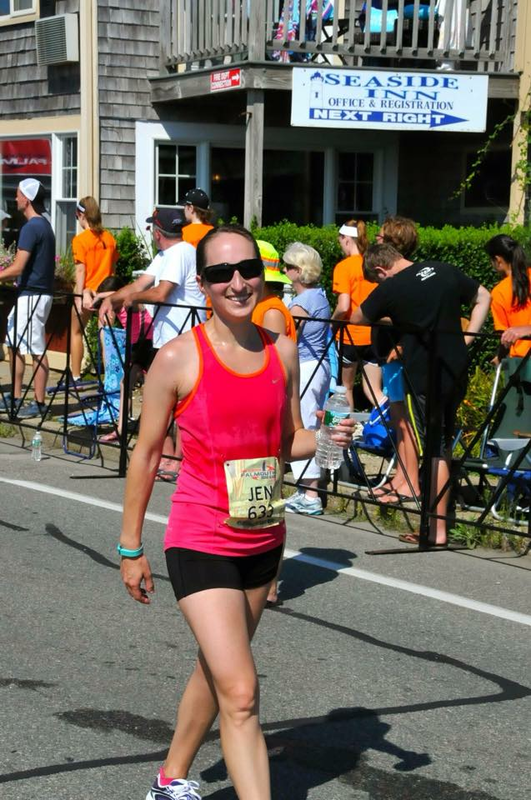 · First time running a race in sunglasses. Bad decision: There was a slight headwind so my sunglasses were foggy almost the whole way. Also lots of water splashed on them making them spotty and annoying. · First time pouring water over my head. I had to. Way too many times to count. · First time running through the hoses. I usually avoid them. Any other day wet shoes and socks are not worth it. 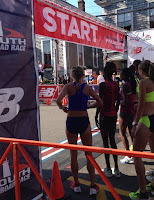 · First time my name was announced as I crossed the finish line! Congratulations to all finishers! 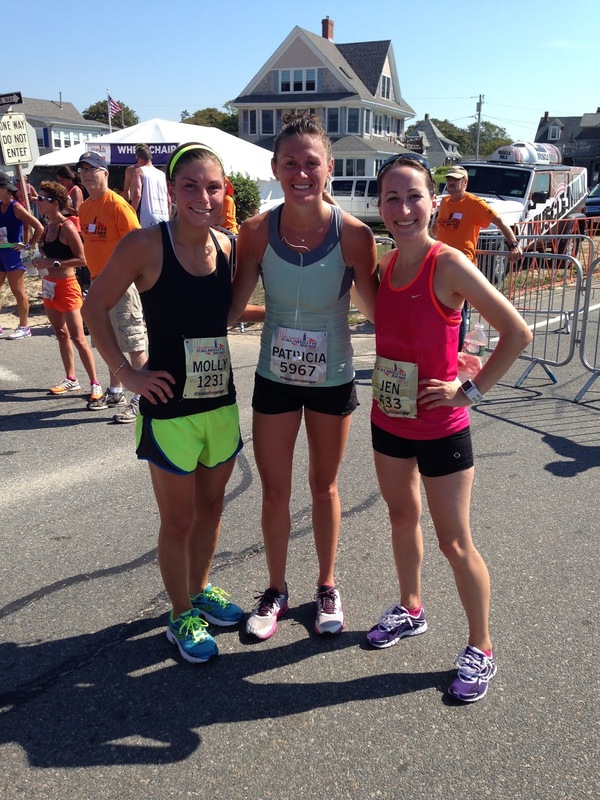 Falmouth Road Race, thank you for a great morning. See you next year!